Q-Connect Staple Remover KF01232 Pack of 1 Q-Connect Staple Remover. Removes staples quickly, easily and safely and its unique design has a lock down device for extra safety. Suitable for use with all standard staples. 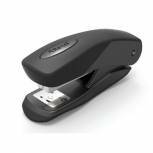 Q-Connect Full Strip Plastic Stapler Black KF01057 Pack of 1 Q-Connect Full Strip Plastic Stapler. Manufactured from ABS with an inner metal chassis for added strength. Sheet capacity of 20 and a throat depth of 80mm. 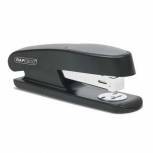 Q-Connect Full Strip Metal Stapler Black KF01231 Pack of 1 Q-Connect Full Strip Metal Stapler. Quality all metal construction with ABS cap for comfort. 20 sheet capacity and a throat depth of 80mm. Colour - Black. 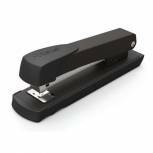 Q-Connect Half Strip Metal Stapler Black KF01044 Pack of 1 Q-Connect Half Strip Metal Stapler. Quality all metal construction with ABS cap for comfort. 20 sheet capacity and a throat depth of 56mm. Colour - Black. 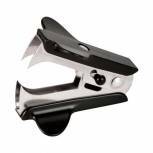 Rapesco Sting Ray Half Strip Stapler Black R72660B3 Pack of 1 Rapesco Office Stapler R7. Modern design with unique soft rubber top cap. Full rubber base and staple refill indicator. Loads half strips. Throat depth 65mm. Capacity 20 sheets of 80gsm paper. Colour - Black. 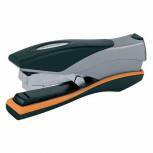 Rexel Meteor Half Strip Stapler Black 2100019 Pack of 1 Rexel Meteor Half Strip Stapler. 20-25 sheet capacity. Takes no.56 or No16 staples. Colour - Black. 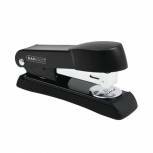 Rexel Ecodesk Compact Stapler Black 2100029 Pack of 1 Rexel Gemini Stapler. 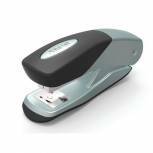 Half strip stapler featuring soft feel rubber base and cap insert. Integral staple remover and new spring pull back mechanism. Sheet capacity - 15. Colour - Black. 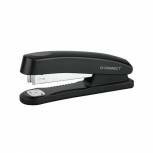 Q-Connect Heavy Duty Stapler Black KF02293 Pack of 1 Heavy duty stapler with 115 sheet capacity. Features tough all metal construction. Adjustable depth gauge 10-70mm and non slip rubber base. 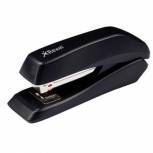 Rexel Aquarius Full Strip Stapler Black 2100016 Pack of 1 Rexel Aquarius Stapler. A full strip ABS plastic metal combination stapler with a unique enhanced jam-free mechanism. Soft feel non-slip rubber base and integral staple remover. Sheet capacity approx. 25. Colour - Black. 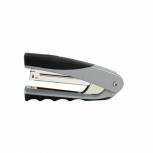 Rapesco 101 Staple Remover Black PSR101B1 Pack of 1 Stylish design with comfortable grip. Easily removes staple by simply sliding under. Ideal for office use up to 8mm staples. Colour - Black. 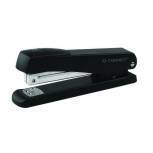 Rexel Matador Half Strip Stapler Black/Silver 2100003 Pack of 1 Rexel Matador Stapler. 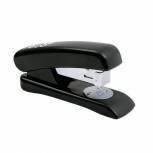 High quality dependable stapler with metallic paint finish. Rubber cap and base. Non slip feet and room for storing spare staples. Loads half strips. Capacity 20-25 sheets of 80gsm. Silver. 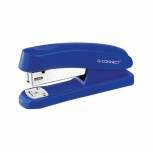 Q-Connect Half Strip Plastic Stapler Blue KF02151 Pack of 1 Q-Connect Half Strip Plastic Stapler. Manufactured from ABS with an inner metal chassis for added strength. Sheet capacity of 20 and a throat depth of 56mm. Colour - Blue. 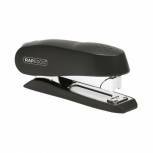 Rapesco Minno Half Strip Stapler Black A52600B3 Pack of 1 Rapesco Minno Half Strip R5 Stapler. Office stapler with a 20 sheet capacity. Full rubber base. Easy top loading mechanism. Colour - Black. 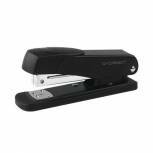 Rapesco Luna Half Strip Stapler Heavy Duty Black 0238 Pack of 1 Rapesco Luna Stapler - 727. Heavy duty. Front loading. Half strip stapler with magazine release button. Safety brake and an all steel chassis. Staples up to 50 sheets of 80gsm paper. Colour - Black. 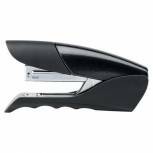 Rexel Gazelle Half Strip Stapler Black 2100010 Pack of 1 Rexel Gazelle Stapler. A half strip ABS plastic metal combination stapler with a unique enhanced jam-free mechanism. 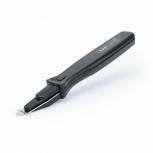 Soft feel non-slip rubber base and integral staple remover. Sheet capacity approx. 25. Colour - Black. 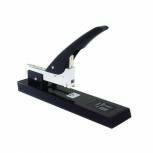 Rexel Centor Half Strip Stapler Silver/Black 2100595 Pack of 1 Rexel Centor Stand-Up Stapler. A versatile stapler that can either stand or sit on your desk. Features include a large cushioned finger grip. Moulded from soft feel material making it very comfortable to use. Staples up to 25 sheets of 80gsm paper. 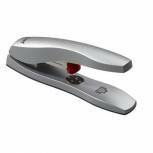 Rexel Odyssey Heavy Duty Stapler Silver 2100048 Pack of 1 Robust heavy duty stapler with a compact die-cast body. The long handle gives extra leverage for easier stapling. Staples between 2-60 sheets. 105 staple capacity. 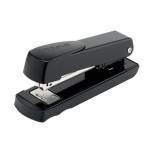 Rapesco Eco Half Strip Stapler Black 1084 Pack of 1 Rapesco Eco Half Strip Stapler. Top loading stapler staples pins and tacks.